I am taking a walk along the path where history interacts with geography and words rub shoulders with images – the vintage postcard path. The destination doesn’t matter and the route is determined by the random selection of old postcards I have bought at an antique fair. Number 10 in the series sees us in the Isle of Man. This picture postcard was sent in 1927, but I suspect that the photograph dates from the end of the nineteenth century. It shows a somewhat precarious pathway over a stream and is entitled “Lhen Coan, Groudle, I of M” The “I o M” part is easy for anyone from the UK to interpret, it is the Isle of Man: that curious outcrop in the middle of the Irish Sea which seems for ever unsure as to whether it is part of Britain or indeed part of the twenty-first century. Mr Wiki Pedia tells me that Lhen Coan is not an elderly Canadian singer of sad but beautiful songs, but the Isle of Man’s only natural canyon which is situated in Groudle Glen which is on the east coast of the island. 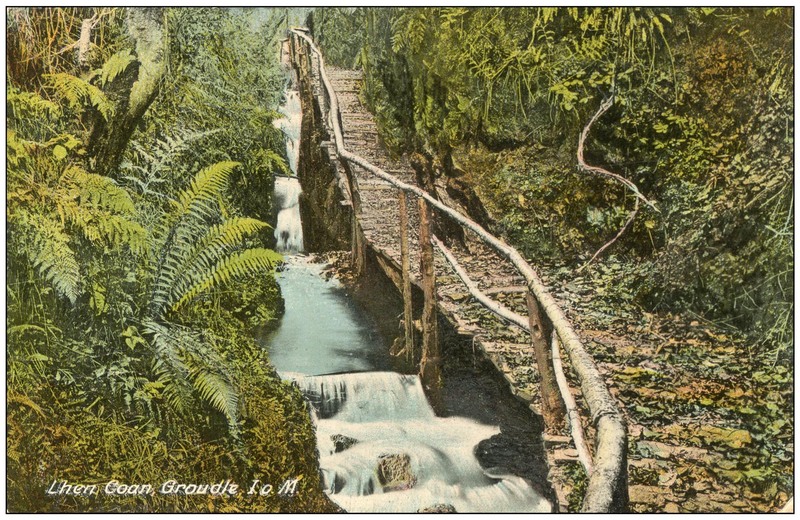 Groudle Glen has a fascinating history and at the time of the postcard it boasted a zoo, a railway, an open-air dance floor and a variety of entertainments. Lhen Coan (which in Manx Gaelic means “Lonely Valley”) was a place you could take a quiet walk when you were tired of the bright lights of Groudle Glen, and you could explore the peaceful little valley by means of the rustic pathways. The pathways have now fallen into disrepair and the zoo and the dancing are long gone, so once again Lhen Coan can live up to its name. When I first read the message on the back of the card I made the assumption that the qualification to the promise “We shall be home tomorrow Saturday sometime towards evening, if fine” was a reference to the hazards of sailing from the Isle of Man in difficult weather conditions but then I discovered that the card was posted in Horncastle which is only twelve miles or so away from Alford where it was being sent. 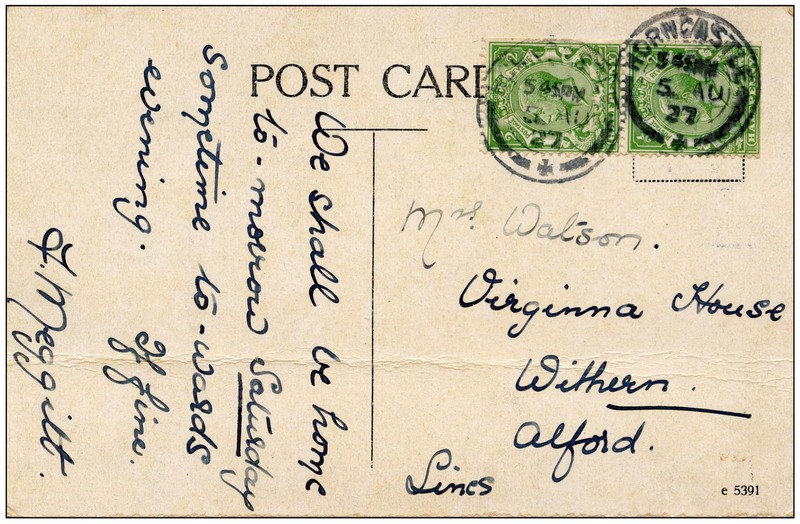 One final little connection to note is that the card is being sent to Mrs Watson at Virginia House. There are all sorts of ties and connections between this little sleepy part of Lincolnshire and Virginia in the United States. Captain John Smith – the same John Smith who established the Jamestown settlement and was later saved by the love of Pocahontas – grew up in Alford and the great political philosopher Tom Paine – author of The Rights of Man – was briefly an excise officer in the town. So we have been taken on a journey from Lincolnshire to Virginia, via the Isle of Man thanks to the motive power of nothing more than a dog-eared old picture postcard.